Becoming "customer centric" is a top priority today, and for good reason: as if it weren't important enough that customers buy products and contract for services, they now do much more than simply buy. Customers participate in social media networks and chat rooms; they write blogs and contribute to comment sites; and they share information through sites such as YouTube and Flickr. Their activities and expressions not only reveal personal buying behavior and interests, but they also bring into focus their influence on purchasing by others in their social networks. 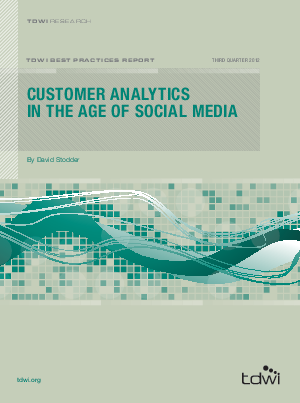 This TDWI best practices report examines organizations' current practices and future plans for customer analytics technology and implementation, with a special focus on how organizations are adapting knowledge as well as challenges of social media networks.